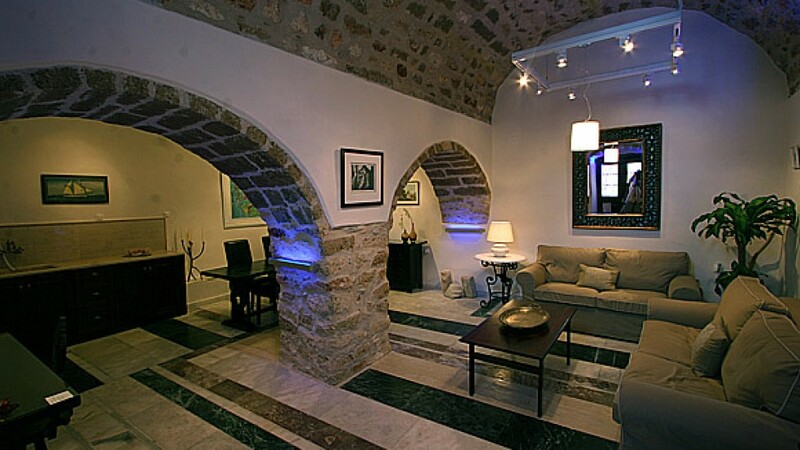 Maroudas House – An atmospheric ground floor apartment of approx.100 sq.m located in the fortress of Monemvasia, Peloponnese, is offering you a comfortable and luxurious stay to enjoy your holidays in this amazing picturesque environment. The guest house is part of the main building of the so called “the house of the 5 terraces”, property of N.Kalogeras, member of one of the most distinguished families of Monemvasia, in early 19th century (1837). The stone pillar which is structured in the middle of the main area of the house forms two arches and supports the two domes ceiling of 4,5m height and 7m long, is an impressive architectural ornament. The existence of two cisterns and an old iron fragment indicates that this was an important public building (17th century). The house was fully refurnished in 2007 by its owner, J.Maroudas. Situated only a few minutes of the entrance of the fortress it is consisting of a lovely bedroom (3rd dome, with the 2nd cistern ), with a sea view, a small hall with a wardrobe and a marble English style bathroom and in the main area (two domes) a kitchenette facility, dining room with a monastery style table and sitting room with a sea view through a path which leads to the edge of the fortress where you can admire the endless blue of the Aegean sea. Fully furnished with elegancy, fully air conditioned, satellite TV, DVD player, high speed internet, and fridge. It can accommodate two to four persons.